Warnings and additional info: As a completely improvised show, the content changes daily. However, there is a very high probability of swearing and adult content. This show is expressly not a family show. An entirely improvised Harry Potter comedy play, based on a suggestion of a fan fiction title. With live musical accompaniment! From the team behind Fringe smash hit Spontaneous Sherlock. Edinburgh Fringe 2018 sell-out show! ***** 'Unbeatably clever' (EdinburghGuide.com, 2017). ***** 'Flawlessly-executed improv comedy... pure, unadulterated hilarity' (EdFringeReview.com). ***** 'Side-splitting laughter across the entirety of the performance' (ThreeWeeks). ***** 'An ingenious, laugh-out-loud show... perfect for Potterheads and muggles alike' (EdinburghGuide.com, 2018). Scottish Comedy Award 2018, Best Variety (Winners). 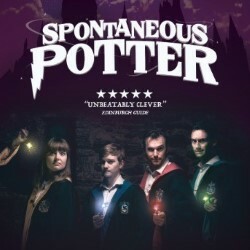 Note: Spontaneous Potter is an unofficial show not endorsed by or affiliated with Warner Bros, JK Rowling or her publishers.